Archway Holdings acquired a 40.3k sf office property in Hollywood. The price was not disclosed, although we can tell you that it last sold a little over three years ago for $19 mil, or about $470/sf. The building was the home of Glen Glenn Sound, some years ago. 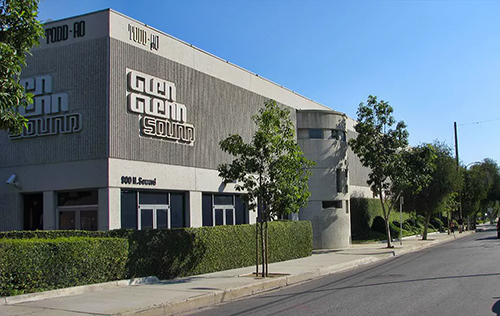 Located on 1.47 acres at 900 Seward St, in Hollywood’s Media District, the site consists of a two-story, state-of-the-art post-production facility, fully leased to Deluxe Entertainment through 2025. The building is considered to be one of the premier post production facilities in the country, containing seven audio stages that are supported by a central machine room, edit bays, R&D rooms, administrative offices, kitchens and lounge areas. It is located near such companies as Sunset Los Palmas Studios, Netflix, CNN, LiveNation, Viacom, and Buzz Feed. Mike Longo, Todd Tydlaska and Sean Sullivan of CBRE represented the seller, Curo Enterprises, which had acquired the property in late 2015 from Vista Investment Group LLC. This is the second time CBRE represented Curo in the sale of a Los Angeles property in the past two years. Curo is led in the region by Managing Partner Louis S. Caiola, Jr.
Also in Hollywood, Archway Equities recently repositioned a 60k sf facility at 1800 Vine St, directly across from the iconic Capital Records Building. Demand for Hollywood office and production space continues to be strong, which in turn has been driving investor demand, according to CBRE’s fourth-quarter research. The year ended with a flurry of big deals from large tech and media companies that have expanded in the immediate area and also in nearby Culver City. Companies headquartered in the Bay Area, Seattle and China signed deals larger than 100k f as the convergence of content creators and delivery companies fueled growth in the market. Buildings with access to the region’s expanding rail system have been particularly popular with tenants because of their strong live-work-play dynamics. Large blocks of high-quality space are in short supply in West LA and Hollywood, where existing assets are shrinking, and new construction is pre-leased. This thriving demand in Hollywood and across the region has positioned Los Angeles in the top spot in CBRE’s 2019 Americas Investor Intentions Survey, a position it has kept for the past four years. The survey, which covers all asset types, found that investor appetite for risk is lessening this year. The most common motivation for purchasing real estate in 2019 is to secure a stable income stream (32%)—a much higher share than in past years—followed by expectations for capital growth (20 percent).